International Day of People with Disability is on 3 December 2018, and is a significant day for the Department of Human Services. The department is leading the way and has a range of support tools available to help staff with day-to-day tasks – whether they work in customer service, in a support role or any other part of the organisation. The Australian Network on Disability recognised the department in 2017-18 as a top performer in demonstrating a long-term commitment to providing access and inclusion for employees with disability through a number of strategies. 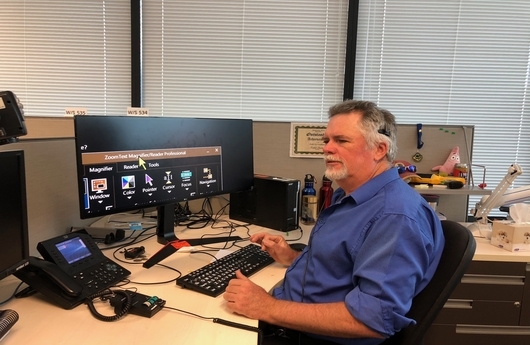 Analyst Programmer, Craig Newbery, is based in Canberra and has worked for the department for almost 20 years. He has vision loss and has experienced the benefits from some of these initiatives. “Zoom Text is a computer tool which magnifies text and changes the colour of backgrounds for easier viewing, and it’s the tool I use the most,” Craig said. “The software also has screen reader abilities which I’ve become dependent on, as well as electronic and desk magnifiers. 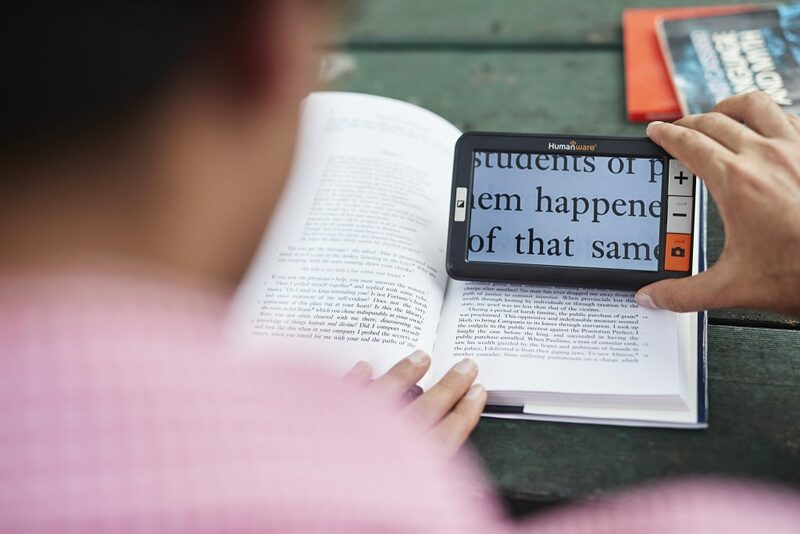 Vision Australia client using a video magnifier to assist in reading a book. “An important part of my role is creating and maintaining computer programs. I have to be able to quickly and accurately read large amounts of text to be able to pick out small relevant sections. These tools allow me to do this easily. Vision Australia’s National Employment Services Manager Jan Hauser says the department’s relationship with her organisation ensures people with a vision impairment can flourish in their jobs, even if their sight continues to deteriorate. “Vision Australia supports people who are blind or have low vision to be able to work in their chosen role,” Jan said. The department has also facilitated the creation of a personal emergency evacuation plan for Craig. “I discussed a personal plan in case of an emergency with our fire wardens to come up with the best option – in my case it’s a buddy system,” Craig said. Vision Australia client using ZoomText screen magnifier in the workplace. General Manager Kirsty Faichney is one of the department’s Disability Champions. “The role ensures our senior executive help develop programs and initiatives to provide support and assistance to staff with disability,” Kirsty said. “As at 31/10/2018, the department currently has 5.2 per cent Australian Public Servant employees who identify as having a disability. The Australian Public Service representation is at 4.3 per cent, demonstrating we are an employer of choice. It’s important we recruit a diverse workforce, to reflect the diversity of the Australian community, who we serve. “Our recruitment processes are inclusive to ensure employment opportunities are provided to people with disability at all levels – from trainees and apprentices to people applying for executive level roles.